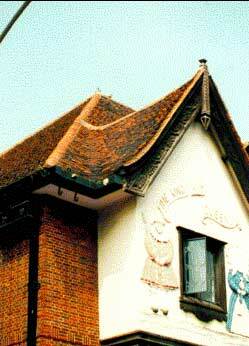 The traditional form of building material in Sussex is the clay roof tile. This is properly called a plane tile and consists of a fired clay slab, six and a half inches wide and ten and a half inches high. 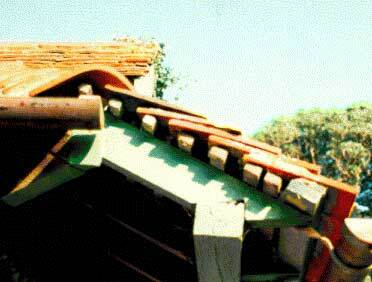 These tiles are laid on roofs and because they are hand made they are not particularly flat and therefore a roof laid in hand-made tiles has to be laid to at least 45 degree pitch so that one can see where a roof has been laid previously with clay plane tiles and been recovered with something else. 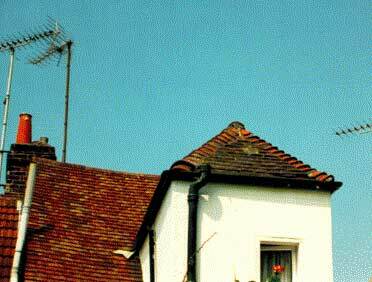 A clay plain tile is a heavy tile by the nature of the material. One has to have at least 2 layers of tile and sometimes 3 layers, so it is a fairly heavy material. 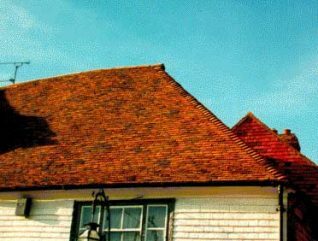 The traditional way of covering ridges, which is the top surface of the roof, is by using a half-round or an angular ridge tile. The hip which is the sloping surface between two roof surfaces can either be covered with a half-round tile or, by using the bonnet hip tile, which looks very much like an old-fashioned lady’s bonnet. Roof materials do have a limited life so that you do find that over the years the materials get changed. One still uses plane tiles nowadays but since the first World War one has been making these of concrete and of course nowadays this is the norm. Clay roof tiles are forever. The best investment for you home is the roof and the floor.